Details : “Good wine must be served in a good glass.” A quality glass should also accentuate the wine’s aroma or bouquet, a point that leads on to the harmonious relationship between anatomies. LUCARIS successfully launched the latest wine glass series “Desire Collection” in LUCARIS Master Class under the concept “A Magic of Aerlumer®”, first time in Mumbai with full gratification from more than 100 honored guests from 5 star hotels, fine dining restaurants as well as top media in Mumbai. 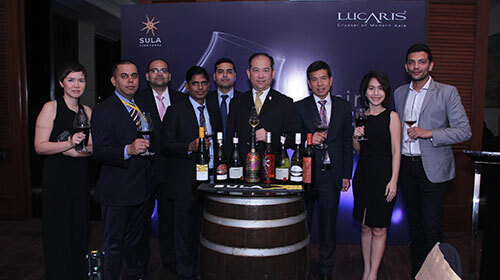 All guests experienced the magic of Aerlumer® through wine & glass pairing activity in collaboration with SULA wine, the number one wine & spirits company in India. The guest of honor and speaker was Mr. Nelson Chow, the President of Hong Kong Sommelier Association (Greater China) and the Vice President of ASI Asia Oceania and he is also the co-designer and co-developer of the Desire Collection. The event was held in 3 March 2017 at the Family Lounge, JW Marriott Mumbai Juhu. Aerlumer is the signature of wine glass innovation, the five beautiful curl lines at the bottom of the Desire glasses which can increase the micro-oxidation while swirling, leading to the new height of wine appreciation.